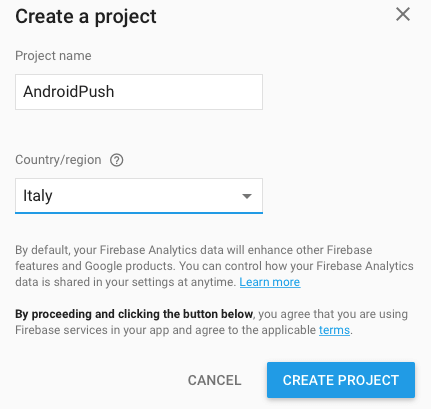 This post will cover step by step how to send push notification from Firebase console to an app. What is Firebase push notification? Before digging into the details of how to send Firebase push notification in Android using Firebase cloud messaging, it is useful to clarify what is push notification. For example, through push notification, our app can notify a user of new events. This happens even if the Android app is not working in the foreground. Using this service, we can send data from our server to our app whenever a new event occurs. This paradigm is much more efficient respect to keep on connecting to the server (pull method) to ask if there are new events. 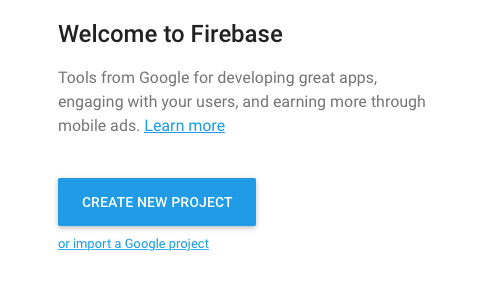 At the end of this process, your project is configured on Firebase and you are ready to develop your Android Firebase app. In the end, you get a json file that you have to copy at the app module level. Want to go have more information about Firebase and IoT? Now we can develop the Android app integrated with Firebase. As a first step, we have to add Firebase to our app and modify gradle files. In this case, we added messaging dependency. Once the gradle files are configured, the next step is creating our app. In the MainActivity we add a Button to get the current token. This token is important because we use it in the Firebase console, to set the right destination device. Notice we used FirebaseInstanceId singleton to the get the current instance and then the current token. It may take a while before the token is generated, so you could get a null value at the beginning. Moreover, we can monitor the token creation process and get notified when it is available using a custom service that extends FirebaseInstanceIdService. In this case, the Android service overrides the onTokenRefresh method. In this method, we just log the token, but it could be used in a real app to send the token to the server so that the server stores it somewhere. Do not forget to declare this service in the Manifest.xml. In onMessageReceived method, we simply show the notification containing the message sent. An interesting aspect is the Firebase API. In other words, it is possible to invoke Android Firebase services using API. This is very interesting because we can integrate Firebase with external systems. In this example, we will show how to send a notification invoking Firebase API. 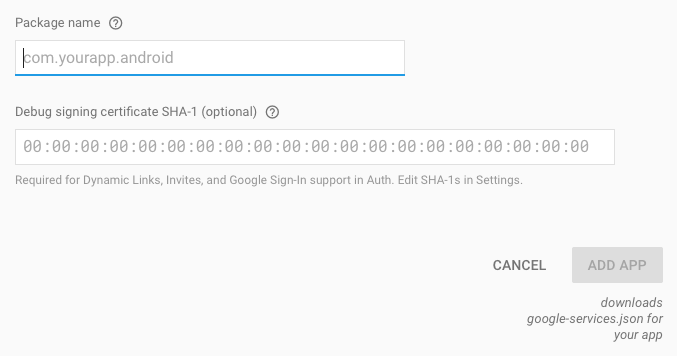 The first step is getting the Firebase authentication key so that we can authenticate the client. As a client, we will use Postman but we can use other clients too. Notice that to contains the smartphone token (described above). And the notification appears on the destination smartphone. 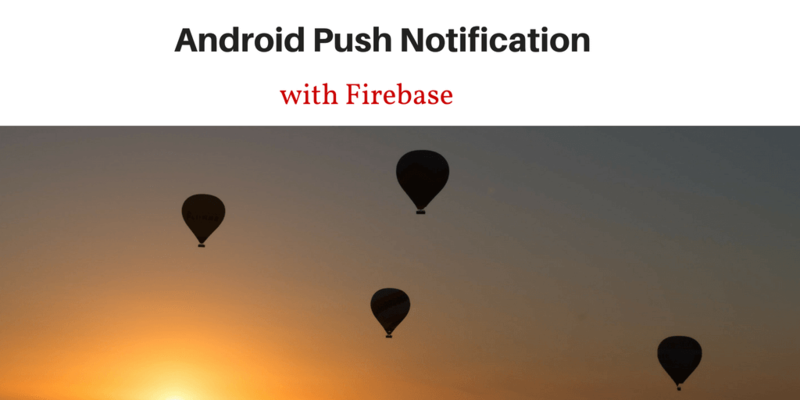 At the end of this post, you gained the knowledge of how to use push notification in Android using Firebase. We have developed an Android app that receives Android notifications. Moreover, we have discovered how to configure Firebase to handle push notification. Finally, we have covered how to use Firebase API and how to integrate Firebase with an external system using these APIs. You can expand further this project and handle different scenarios. Firebase Push notifications in Android are very useful and an Android app can use them every time is necessary to send an alert to users. There are several scenarios where Android notification can be integrated with Internet of Things: alert related to environmental monitoring or production systems and so on. Once you know how to handle push notification in Android you have countless possibilities. Thanks for your detailed tutorial. I have implemented this and working fine except the device not receiving push if the app force closed. Do you have any idea about this? If I force close app it does not receive push. From where we can create our message to send? Is it require to set up server on our hosting for it or we can access it form some where else on Firebase console. Please let me know about it. Can you explain? You can access Firebase using a client that wants to send notifications. If you want to test it, you can use the Firebase console. Did you have an answer of your question? Google provides exceptionally bad explanations from tool to tool. Sometimes I ask myself do they want to make the tools usable. I want to send message to a topic. Can I do this way of FirebaseMessaging.sendMessage(RemoteMessage r)?? I don’t see any simple manual, example, header list, how I must define the topic in builder. Firebase tool on Android Studio takes me to irrelevant information how to subscribe from link “send..”. The only simple question, can I build and send topic message, and which data header correspond to topic, which to body. No information. If the app is in the background, I can’t set LargeIcon to notificationBuilder because onMessageReceived is not called. i love you for this….. i really do… straight to the point, effective, effiecient and powerful. i love you once again…. i just bookmarked your website…. 🙂 ..if only i could pay you enough.